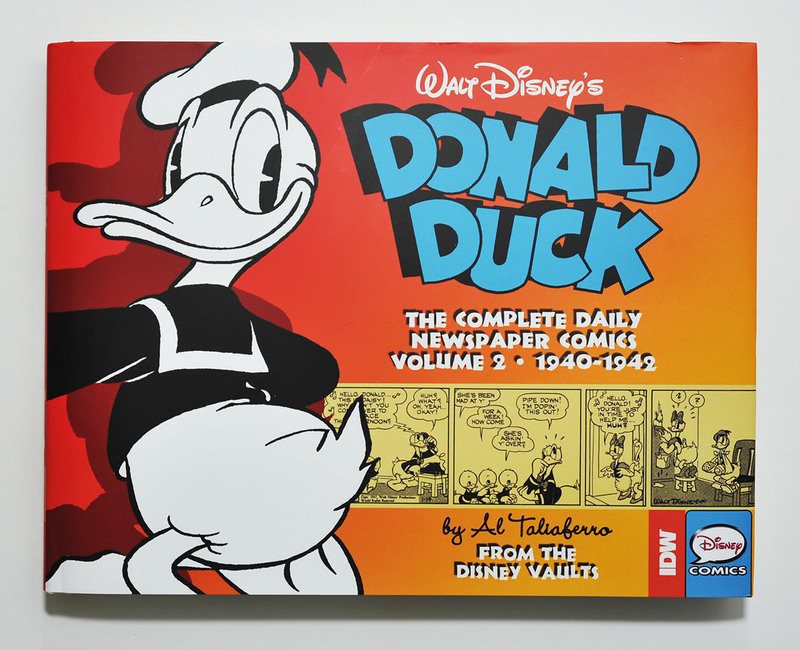 I got the second volume of IDW’s Donald daily strip collection a few weeks ago. This book collects all daily strips from July 22, 1940 to January 2, 1943 plus the second part of David Gerstein’s essay about Al Taliaferro. I was a bit disappointed with the bonus material in the first volume, so I didn’t expect to see much of that in this book. But we got some rare publicity drawings and all Taliaferro illustrations from a 1948 children’s book. And I found the second part of the essay a lot more interesting than the first part, so no complains about the bonus material this time! If I have to nitpick something, it’s that the second part talks about several things we saw in the first volume (the license plate, Gus Goose, Bolivar…) so I think it would be better to say something about that in the first part. But it’s not a big deal. The first volume had really good quality reprints of the strips, and from the credits it sounded like they had tracked down various sources to get the best possible quality. 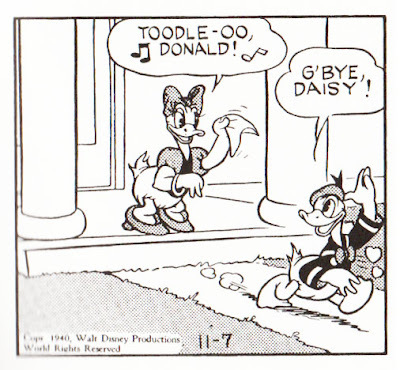 This volume also started with clean and good reprints, but a good deal of the 1942 strips seems to be from a less good source. Here are a few examples comparing the IDW collection (left) to the Norwegian strip collection (right). It might have been difficult to obtain better source material, but I hope they at least tried and not just went with the first complete run they could find. For a collection like this I’d rather wait a few extra months if it means getting better source material, or if restoration work needs to be done. There’s no need to rush these books out on the market. I have to admit I didn’t read the second volume as thoroughly as the first one. I just went quick through it, so I don’t have that much to say about the strips (maybe there’s not that much to say either). But here are a few notes about some of the strips in volume two. The first comic appearance of Daisy Duck is in the November 4, 1940 strip. But we don’t see her name until a few days later (November 7) and her full name the next week (November 13). 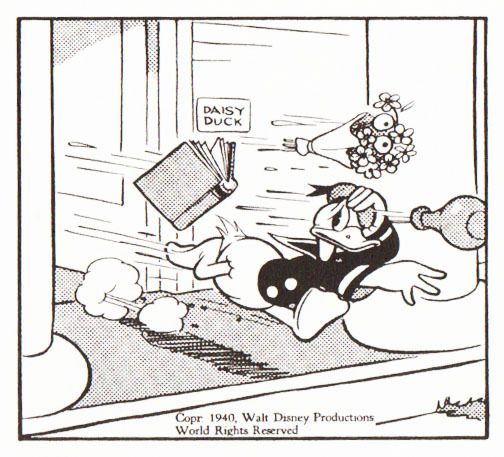 After that she becomes a regular character in the daily strips. 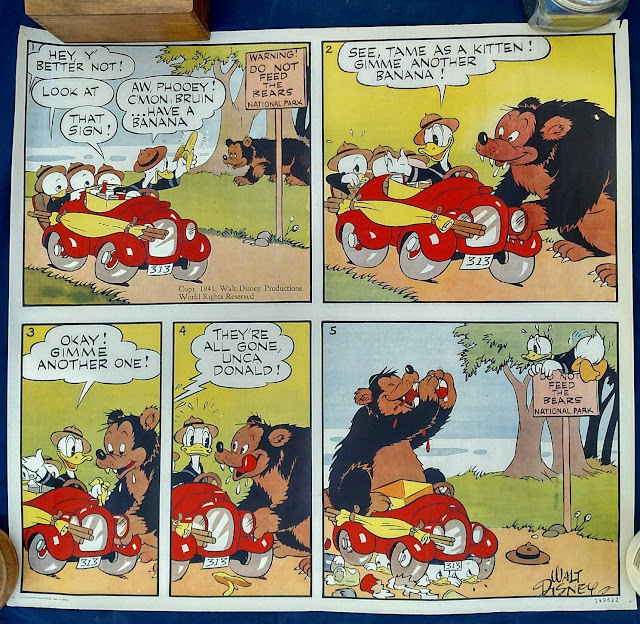 The May 19, 1941 strip was later used as a poster (probably) in National Parks. The images under is from an eBay auction, so I don’t know more about it than what you can see on the images. 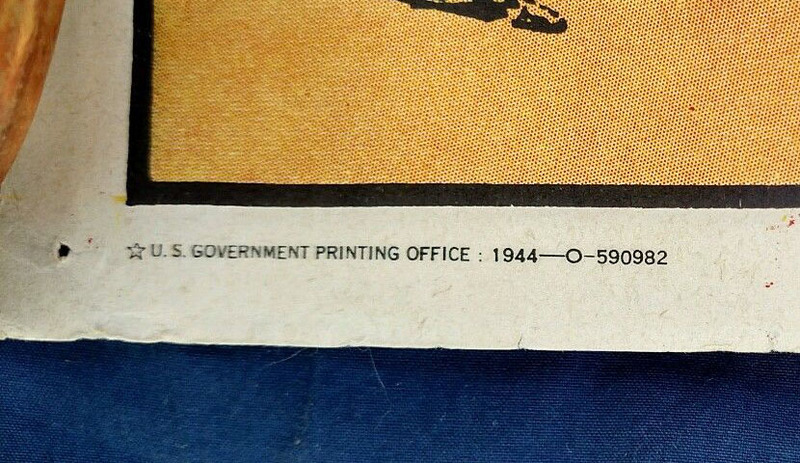 But the sign is changed from "Sequpia Park" (a national park in California) to "National Park", and at the bottom we have the text "U.S. Government Printing Office 1944". If anyone has more knowledge about this poster, please comment below! 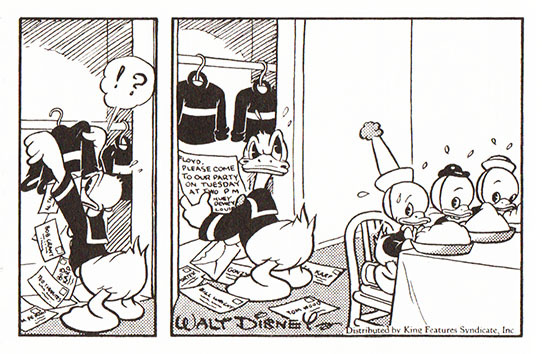 There are a lot of wartime themed gags in this book, not that suprising as the strips are made during World War II. We also get notes with a plea for help inserted into the comic strips, as seen in the examples below. The same logo/stamp is printed in a lot of 1942 strips. The first one say "You Help Someone You Know, When You Give to USO" and is for the United Service Organizations. The other one has the text "For Victory, Buy United States War Bounds and Stamps"
After recently finishing up Mickey Mouse Vol. 8 from Fantagraphics, I have to say I was a bit disappointed with the printing quality there as well. Several weeks' worth of strips suddenly have rather bad print quality on the right-hand side, whereas the left-hand parts of the strips look slick and sharp. Take for instance the week of strips on pages 165-166 (8-27 to 9-1/1945): all the strips looks sharp and pristine when you start to read them, but then gradually slide into simply awful quality by the time you get to the end of the strip. Another pain was the way they print the introduction to each story in Volume 8: black type over dark dark purple, making the text virtually unreadable. They should have used white type instead. 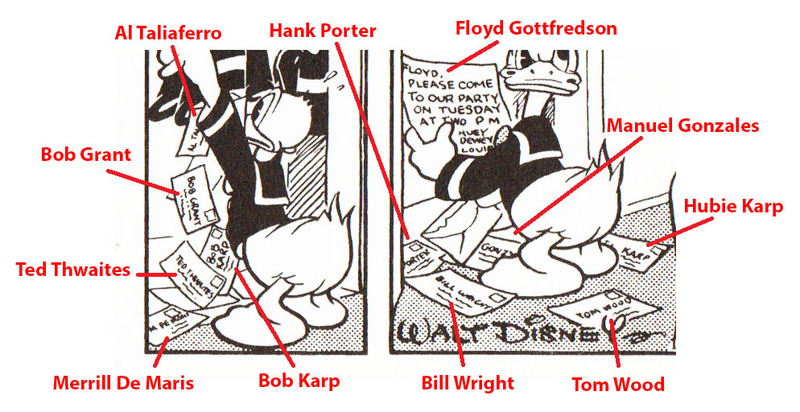 It's kind of incomprehensible to me that noone at Fantagraphics caught that mistake before the book went to press. Not that I found Vol. 8 bad overall, but it exudes a sloppiness in certain details which I don't generally associate with these Mickey Mouse books. I hope Vol. 9 picks up. 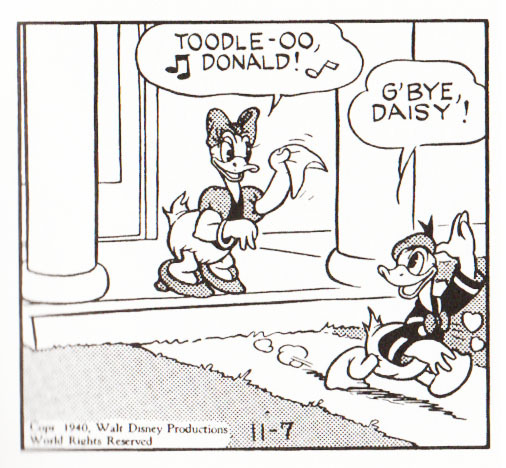 Yeah, I was a bit disappointed to see this batch of bad quality strips in the second volume. 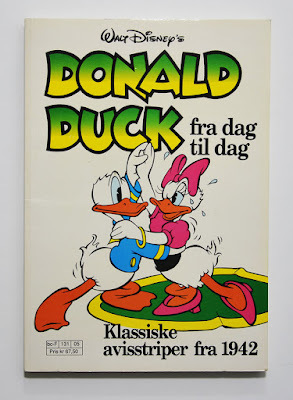 Sometimes in the future we might see a digital archive of all the daily strips – but before that happen I guess the IDW collection is the definitive collection of Donald Duck daily strips. I can't imagine any other publishers doing a new and better printed collection of the original (English language) strips. So I hope the editors do their best to find the best possible source material.